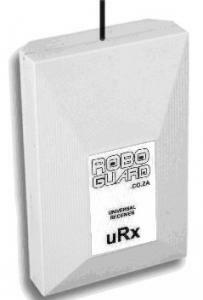 The uRx is used as the receiver for the Keypad, uTx (Repeater Station) and other Roboguard decoders. The Universal Receiver is also used to remotely trigger the operation of electronic devices using Roboguard signals. The uRx can be "taught" to respond to Roboguard, Intruder and Remote Tx Signals.